It's a good practice to create one repository for the entire company or department and store all your projects in this repository. Creating separate repository for each project is not a good idea because in that case you will not be able to perform Subversion operations like copy, diff and merge cross-project. 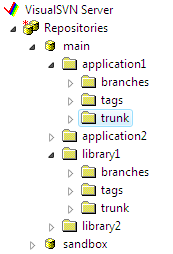 It's not required but usually each projects has 3 subfolders: trunk, branches, tags. The trunk folder contains the main development branch, the branches folder contains subfolders with temporary copies of trunk for experimental development, release stabilization etc. and the tags folder contains copies of the officially released versions.